Weruva began when founders Stacie and David Forman stumbled upon a stray kitten on the streets of Manhattan. Two more rescue cats later and the luxurious, natural pet food company was born! 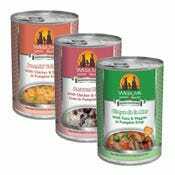 Weruva pet food is produced in a human-grade facility, using quality base proteins such as chicken, beef, and fish, fresh vegetables and unique ingredients such as grilled calamari. All Weruva pet food has a natural look and recognizable texture.